Is your workplace equipped to tackle disability issues? Public understanding of disability issues in the UK has soared in recent years. Achievements such as those of Britain’s Paralympians in the London 2012 games and the late physicist Stephen Hawking have helped to transform perceptions of what those with disabilities are capable of. 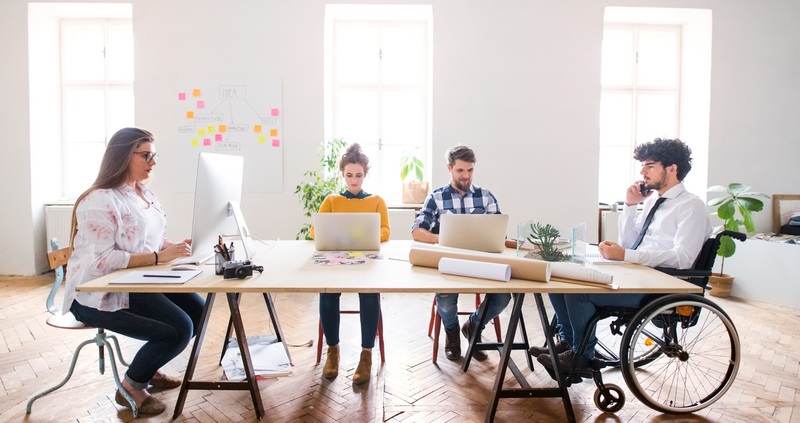 As a result, there is a greater appreciation that disabled people can contribute great things in the workplace and play a full role in a company, developing careers just like anyone else. The UK marked Purple Tuesday on November 13th, a day that highlights the economic spending power of the disabled. This amounts to £249 billion, reflecting the fact that this group is not living off benefits, but is playing a major part in the economy throughout the workplace. Nonetheless, there can still be problems. Discrimination has not been fully eliminated and there are many ways in which workplaces are not fully equipped to provide the extra facilities some disabled people may need to do their job. To mark Purple Tuesday, the government published its latest work statistics for the disabled, noting that, in line with the general rise in employment, 973,000 more people with disabilities are in jobs now than in 2013. It also noted this month marks the first anniversary of the Disability Confident Scheme, a programme designed to help companies ensure they are geared up to offer the best possible work opportunities to disabled people and break down barriers that may hold them back. Over 9,000 firms have signed up so far, gaining advice on being ‘disability confident’ and learning how to recruit, train and retain staff with disabilities. A key issue is legal compliance with the requirement to make ‘reasonable adjustments’ to a workplace to help people with disabilities. This could include fitting ramps for wheelchairs to enter the building and various rooms, as well as extra space to enable users to get around the premises. Equipment may be modified to make it easier to use, such as having a device that translates speech to text for the benefit of a deaf person, or specialised furniture to sit on. It is important to note that making reasonable adjustments is now a legal obligation under the Equality Act 2010. That means if employers clearly fail in their duty, or act in a discriminatory way, they could be liable to prosecution or face an employment tribunal, with all the potential financial, legal and reputational consequences this could entail. By contrast, getting it right can bring great rewards through accreditation under the Disability Confident Scheme and a reputation for being a good employer for all people, able bodied or otherwise. Not only will this give a firm a generally positive image, but it will also make it a specific magnet for those with disabilities looking for an employer they can trust, where they can make the most of their talents and maximise career opportunities. Moreover, at a time when employment rates are high and skill shortages are low in some sectors, to neglect making a company attractive to disabled people is to miss out on some of the scarce talent that is out there. Therefore, working to make sure a business is geared up to offer good opportunities to disabled staff is not just to benefit them, but to give a company a better chance of thriving.